In “Sports Psychology Sessions with Doc,” Dr. Patrick Cohn answers a question from a sports parent that doesn’t know how to help her young tennis player control his emotions on the court. Are you a parent or coach of young tennis players that tends to give up, tank, or get upset emotionally because they are playing a tough opponent or they’re losing? 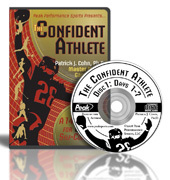 Give your athletes the skills to improve composure in matches. How do you give them the skills? Watch the video to see what mental game tips Dr. Cohn gives to sports parents to help their young tennis players with emotional control. Subscribe to the Peaksports YouTube channel now to receive updates on our new content! Visit Sports Psychology for Athletes at Peaksports.com and click on contact us to submit your mental game question for Dr. Cohn to answer in his mental game videocast or podcast. You can work with Dr. Patrick Cohn himself in Orlando, Florida or via Skype, FaceTime, or telephone. Call us toll free at 888-742-7225 or contact us for more information about the different coaching programs we offer! One-on-one mental game coaching with Dr. Cohn. Do You Underestimate Your Opponents? Why Do Young Athletes Want to Quit Sports?